The three Carman daughters, from left: Helen Adelia,(Della), born - D.L.C. [Donation Land Claim] 1860, died - June 1912, Kelso, Wash. Mary Lucretia, born - 1856 D.L.C., died - May 1921. Henrietta Sussannah (Etta), born - August 1858 D.L.C., died - March 1925. OA#115. Description Pinholes on top edge. Mounted on cardboard. 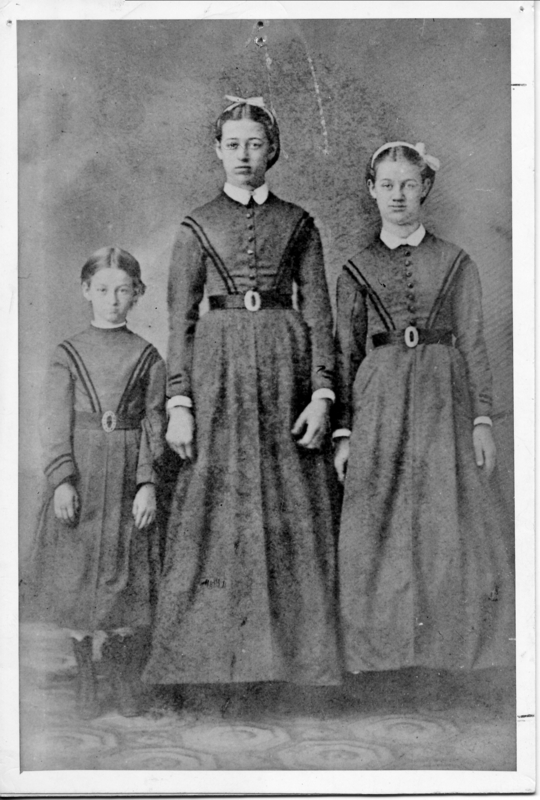 Transcription The three Carman daughters, from left: Helen Adelia,(Della), born - D.L.C. [Donation Land Claim] 1860, died - June 1912, Kelso, Wash. Mary Lucretia, born - 1856 D.L.C., died - May 1921. Henrietta Sussannah (Etta), born - August 1858 D.L.C., died - March 1925. OA#115.